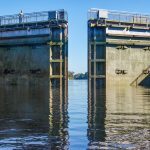 The Buckman Lock was constructed in the mid to late 1960’s as a part of the Florida Cross Barge Canal project. The project’s goal was to connect the Atlantic Ocean with the Gulf of Mexico with a canal across Florida. It didn’t go well. The on again off again project was first conceived by King Phillip II of Spain in 1537! Throughout centuries, the project was started and stopped due to numerous funding issues and in the end it was Marjorie Harris Carr who helped bring about the official cancellation of the project in 1990. 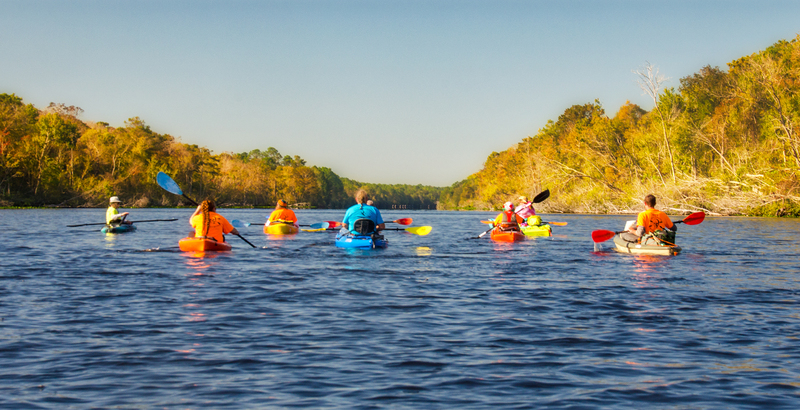 It was Marjorie, members of the Audubon Society and others who founded the Florida Defenders of the Environment (FDE), who in turn, filed suit, along with the Environmental Defense Fund and brought about the eventual de-authorization of the project! 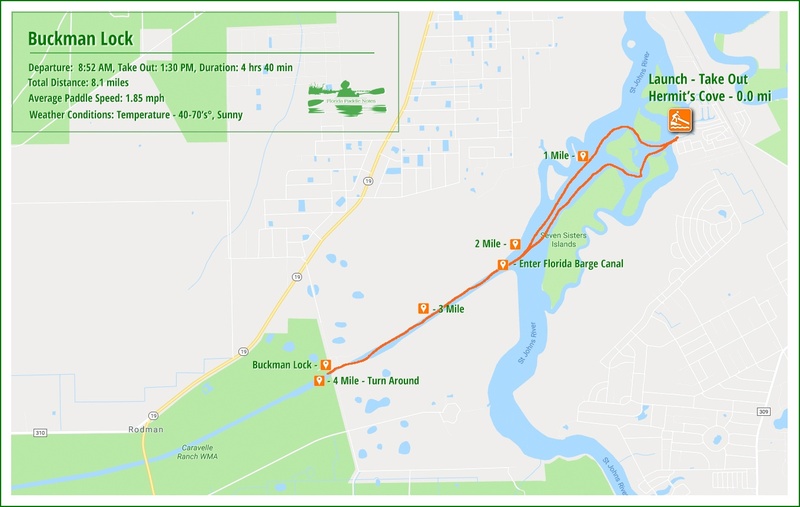 The Florida Barge Canal is now officially the Marjorie Harris Carr Cross Florida Greenway. 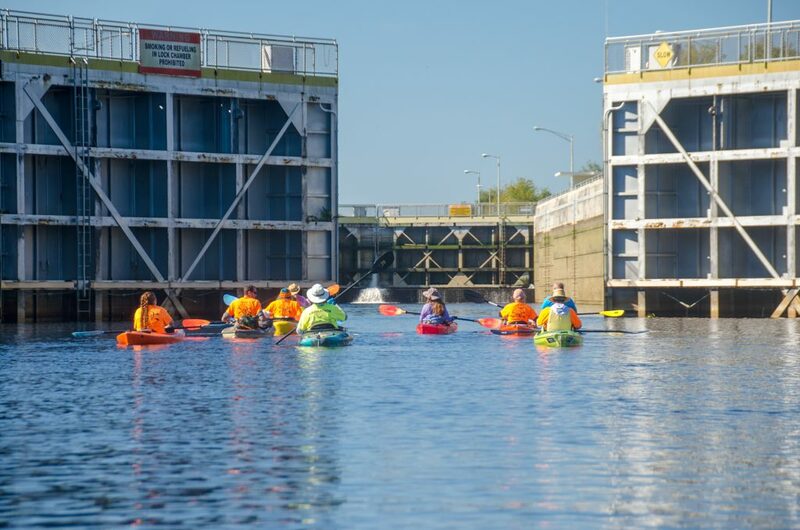 Location: The Buckman Lock is located in Putnam County, approximately 9 miles southwest of Palatka, 5 miles West, across the St Johns River from Satsuma. Hours: 8 a.m. until sundown, 365 days a year. Staffed seven days a week from 7 a.m. to 3 p.m., closed on Thanksgiving and Christmas. 210 Buckman Lock Rd. 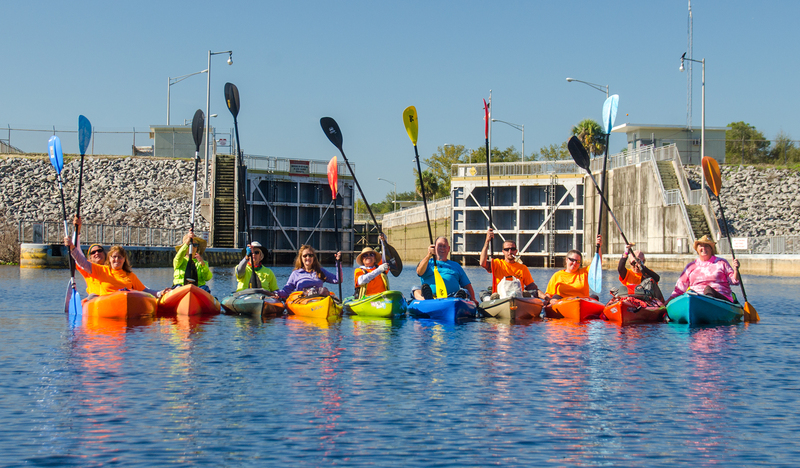 Palatka FL 32177, 386-329-3575 Call ahead to get times the lock will open. Launch/Take Out Point: The launch is located at Hermit’s Cove, 482 Cove Dr, Satsuma, FL 32189. Paddle Distance: Approximately 8 miles round trip. Difficulty: Easy to moderate. I say moderate depending on the weather and wind conditions crossing the St Johns River. Average Paddle Speed: 1.8 – 2.5 mph. 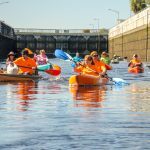 Width and Depth: The average width of the navigable portion of the St Johns River is about a 1/4 mile, while the canal averages from 225′ to 250′ wide, approximately 12′ deep. Current – Tidal: The effects in this area of our paddle from tides are within the 1.2′ range from low to high tide. 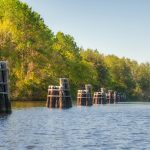 On the St Johns River side of Buckman Lock ( East ), the canal and St Johns River average around 4′ above mean sea level, while the West side of the lock, Rodman Reservoir, the water level is 18′ – 20′ mean sea level. Side Paddles: Side paddles are not applicable on this portion of the canal. Rest Areas: Restrooms available at the launch as well as the take out. Along the canal there are areas to come ashore for a break. 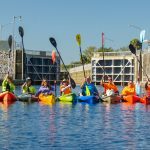 Today’s trip with the Boll Green Aquaholics started out quite cool, as we prepared to cross the St. Johns River and make our way into the Marjorie Harris Carr Cross Florida Greenway to Buckman Lock. With temps in the 50’s, we launched around 9:00 am from Hermit’s Cove, on the East side of the St. Johns River, about 2 miles north of Satsuma. 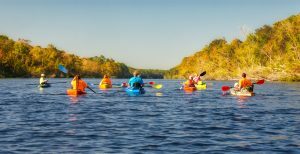 At this point on the river, it is about 1/4 mile across and we paddle through the Seven Sisters Islands on our way to the lock. The wind can be quite a problem once out on the St. Johns, but today, while a bit cool, we enjoyed a mild breeze under sunny skies. In just over 2 miles we reach the entrance to the Greenway, once known as the Cross Florida Barge Canal. Here the canal is about 250′ wide, lined with Pines, Oaks, Maples and Gums. Primrose and Climbing Asters also are scattered along the banks. Not until 1/2 mile into the canal do the shorelines begin to open up if you need to pull over for a rest stop. Just over a mile and a half into the Greenway canal is Buckman Lock. Our timing is pretty good, as there is just a short wait until the lock gates are opened for us. We get a group picture, seen above and as the lock opens, make our way inside the 660′ x 84′ chamber. When the lock closes, eddies form as the water level fills 12′-14′ in a short period of time. Before you know it, the West gate opens and we paddle out of the lock. This trip was just to experience going through the lock. 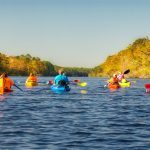 If inclined, you could continue paddling the canal another 5.5 miles into the reservoir formed by Rodman Dam. Within a half hour we were repeating the lock entry and exit and on our way back to Hermit’s Cove. 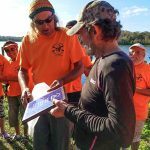 Once there, we celebrate another awesome day in Florida and present the owner of Hermit’s Cove with a plaque for his support of kayakers in the community and thus ending another chapter in Florida Paddle Notes. Looks like a great paddle. Keep the stories and photos coming! 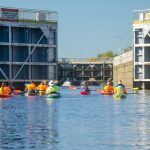 Thank you for documenting the history of the Cross State Barge Canal. Thank you, also, for referring to the “Rodman Reservoir”. Some people insist on calling it “Rodman Lake”. It is a man made reservoir! I agree Moonflower! It is even on Google Earth as Lake Ocklawaha which is totally bogus!